Our brand new and much larger construction hall is nearing completion. The walls are in place, the concrete floor has been poured in and smoothed out and the doors will soon be fitted. 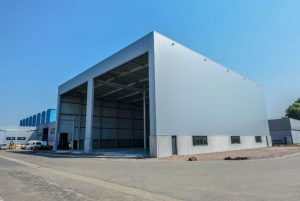 The existing facilities had been too small for Van der Valk’s expansion plans, and the new production hall will allow us to build motoryachts above 40 metres in length and with up to three decks. The hall will be taken into operation in the summer and we are really looking forward to sharing images of the opening ceremony!